Sovaro Coolers. Luxury is near you. Usual tumblers and cups that we use every day even can’t rival with such things as RTIC Tumblers. We think that almost everyone of us has faced with the problem of melted ice inside a cup. It is rather disgusting when your tasty drink becomes diluted with the water that you expected to see inside your cup as ice, isn’t it? Unfortunately many of us are unable to drink up a beverage before the ice inside your cup starts melting. Do you wonder why it happens that way and how you can cope with this problem? Read our article and you will get answers on all your questions. Most likely that you have already read our articles about RTIC ice chest, RTIC SoftPak Coolers and RTIC Can Cooler Koozie, but what when you want only one bottle or cup that will be able to keep an ice inside it? In this article we are going to compare two world-famous brands and give you an ability to choose your next tumbler. 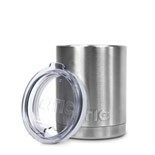 RTIC tumbler will fit you perfectly whether you want a cup of hot drink or cold beverage. This mug is able to keep its content hot as well as it is able to keep it cold. So, you can take to your office either cup with chilled tasty lemonade or with hot tea or coffee. You will be able to use your tumbler immediately after taking it from box. This mug is ready to work. Each cup is covered with a plastic bag when it is in the box. Also you will notice the company label that is wrapped around the cup at one side together with instructions and support information at the other side. In this article we are reviewing tumblers that are able to work not only as a coolers to chill beverages, but also they can hold hot drinks perfectly too. This is the main difference of RTIC tumblers from other similar production. Let’s consider how it works. Each mug is essentially as a vacuum insulated container with double walls. Such construction makes you able to keep hot drinks as good as cold and doesn’t chill or heat up the exterior walls of your cup. Thus you should not be worry that your hands will feel hot or cold temperature when holding this mug. These mugs will make you able to drink your favorite beverage wherever you are and save you from necessity to drink it quickly because in a few minutes it will chill or warm. Manufacturers of RTIC products did their best to create a production that will be able to hold cold inside during rather long time periods. And they have been succeed in it. Can you imagine that you will be able to pour a drink inside your mug and after two or three days find it at the same temperature? Impressively, isn’t it? Manufacturers of RTIC Rambler affirm on their official website that the duration of cold retention terms can last up to 60 hours. Hardly believing, yes? But it is real. After reading users reviews we made sure that their promises are completely true. Users say that their mugs can hold their drinks cold or hot during two or even three days. Available Sizes of RTIC Rambler Lineup. You can find representatives of RTIC production available in three various sizes and choose one that will fit perfectly all your needs.. You can order a small RTIC Lowball version that comes in at 10 ounces, a mid-size cup at 20 ounces or the largest one in the lineup at 30 ounces. Whether you just want a small cup of coffee you want to enjoy hot for the entire day, or need a larger ice cold drink to get you through the hot weather while you are out and about, we think you will find a size to suit your needs. These three sizes of mugs will fit you when you need a small cup of coffee or when you want to take a larger cup when you are going to be out of home all day. You can choose one among previously mentioned sizes, or purchase all three of them in order to have your mug for each occasion of your life. The build of this tumbler, ensures that you can pick it up without worry of freezing or burning your hands. The contents inside of the cup stay at the ideal temperature you need them to be, while the exterior remains a comfortable temperature for you to handle. Specially designed construction of these tumblers allows you to hold your mug without any worrying that you will burn or freeze your hands. Thanks to the design of the mug, its content stays at the temperature you want it to be while the exterior walls of cup will stay at the most comfortable temperature to hold it in your hands. Thanks to construction that consists of the 18/8 Stainless steel RTIC tumbler can become an ideal coffee or tea mug for you to take it to the office or just for a walk. Durable and stylish design of this mug can resist all negative influences that it may be subjected to. Most likely that you have already understood that there are special features that make these mugs ideal and world famous. In this paragraph we are going to consider each of them a little bit deeply. One of the most important moments while designing a cup’s form is that it should be comfortable and convenient to hold it in hands. The special and unique design of the RTIC Ramblers allows you to hold them easily and firmly in your hands. 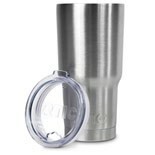 Despite the fact that the RTIC tumblers are created more for holding cold drinks, don’t forget that you are able to use them for holding hot beverages too. Manufacturers state on the official website that the duration of heat retention can last up to twelve hours. Previously in this article we wrote that RTIC tumblers are able to keep content cold for two or even three days, but we didn’t mention the duration of ICE retention time. Manufacturers state that RTIC tumblers can provide you with an ice inside during twenty four hours or even more. For more information about cooler’s characteristics you can check our Best Ice Chests Guide . Just the same way as the previously reviewed RTIC coolers each RTIC tumbler have an air tight seal, thanks to which you mug’s lid is able to hold its content during longer time period. One of the most important moments of our article is the price of RTIC cups. So, how much does the RTIC tumbler cost? If you decide to purchase your mug from the official RTIC website, it will cost you somewhere about $10. Pay your attention that the average cost of the competitors’ mugs will be up to three times higher than this price. So, if you want to get high-quality characteristics together with an attractive price, stop your choice on this manufacturer. Something from RTIC Coffee Mugs Users’ Reviews. 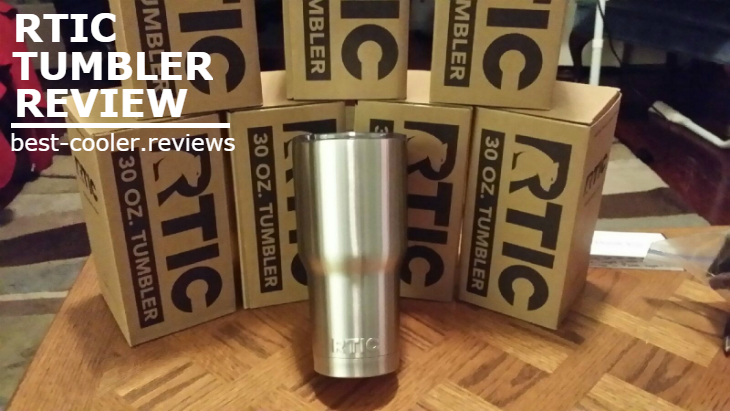 We have already covered quite a bit in this RTIC tumbler review, but what we want to do is let others tell you what they thought of these products. One of the users wrote that this cup is really an EXCELLENT variant. He wrote that it is able to keep beverages cold for many hours and you can also left it filled with ice for the whole night and in the morning still find an ice inside. One more user stated that the duration of ice retention period lasted for twenty four hours. Another one user wrote that he purchase this mug for his friend who works almost the whole day outdoors under the sunrays and said that his friend was fully satisfied with it and was impressed for how long it can hold cold drinks inside. 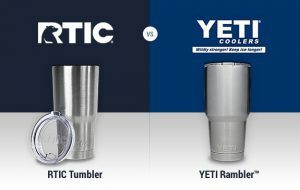 Battle of RTIC Tumbler and Yeti Rambler. Who Will be the Winner? You can see that all essential characteristics of these two brands are completely the same, the difference is only in their…price. The price of Yeti Rambler is four times! higher than RTIC tumbler. So, answering on your question about who will be the winner in this battle we make a conclusion that…RTIC tumbler is the winner! For those our readers who appreciate their earned money and don’t want to spend their wasted, our choice will be clear. It is ridiculous to overpay FOUR times for the same characteristics. In addition to this we can say that hundreds of positive reviews from users prove their efficiency and quality, so you can be sure that your mug will not let you down after the year of using. Nevertheless if you appreciate world famous brand and are ready to spend more money for it, than definitely the Yeti Rambler will suit you more. Eventually this choice is a personal choice of everybody and we will not persuade you to buy one option instead of another. In this paragraph we only compared these two products and make OUR conclusion. Your choice should be definitely based on your preferences and tastes. 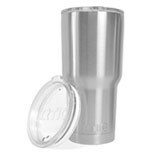 Whether you prefer brand and choose a Yeti Rambler, or you want to save your money and choose RTIC Tumbler, you will not lose with none of them. 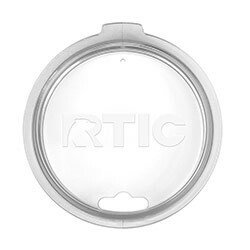 Where Can I Buy my RTIC Cup? 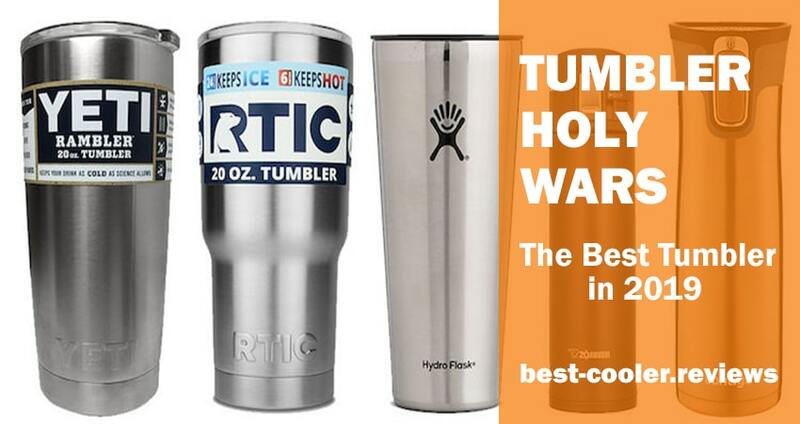 All representatives of RTIC tumblers are available on the official website. But there are some cons in such way of ordering. Because of the fact that website deals directly with consumers, you will not find RTIC production in anyone of your local shops. To cope with this problem you can order these tumblers from Amazon, where you can choose the one that fits you among all available sizes and colors. Also you can read there many veridical reviews from users. All models and sizes of these tumblers are being sold on Amazon and moreover their price on Amazon will be lower than on other websites. So, it will be better to choose the model you like among all variants available on Amazon at the price that you want. In conclusion we want to say that these mugs are the TOP products and advice you stop your search and choose one of the best RTIC Tumblers that will fit you most of all.